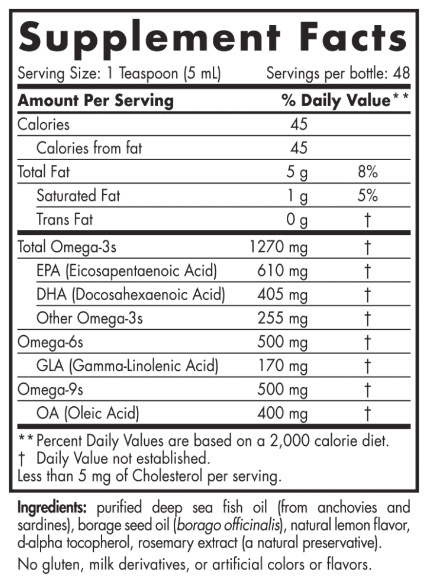 Review Nordic Naturals Complete Omega 3-6-9, Lemon, 8oz. 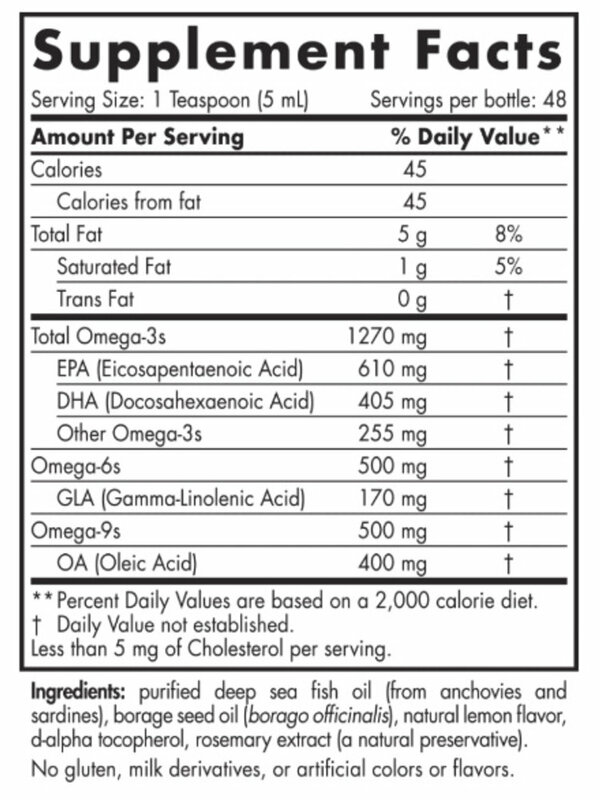 Home Nordic Naturals Complete Omega 3-6-9, Lemon, 8oz. Nordic Naturals Complete Omega 3-6-9, Lemon, 8oz. FULL BODY BENEFITS - Complete Omega provides full-spectrum essential fatty acid support that blends omega-3s EPA and DHA from fish oil to support a healthy heart, normal brain function, and a positive mood, with omega-6 GLA from borage oil that aids with healthy joints and skin, and omega-9. The fatty acid GLA, Gamma Linolenic Acid, is a strong ant-inflammatory that can help with joint inflammation including arthritis. Additionally, it is used to generally improve overall skin condition. GREAT SUPPORT AND GREAT TASTE -Complete Omega is the omega "multi" for comprehensive support. Available in delicious, natural lemon flavored soft gels or liquid. Nordic Naturals place good health first and has no artificial ingredients or preservatives. It is also non-GMO verified, gluten and dairy free. WILD CAUGHT AND SUSTAINABLY SOURCED - Every batch of Nordic Naturals fish oil is crafted from wild-caught, omega-rich fish from the freshest catch, sourced from the cleanest waters, and only in a way that fully protects the ocean's fragile ecosystem. You can feel confidant in high quality supplements that are consciously sourced. BEST ABSORPTION FOR BEST RESULTS - One teaspoon a day with food provides the perfect balanced combination, a healthy balance of omegas 3, 6, and 9. 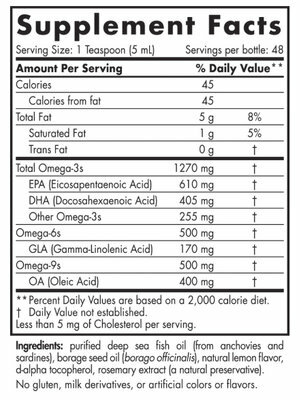 Many concentrated fish oils on the market are in the ethyl ester molecular form-a synthetic fat. Nordic Naturals formulas are produced in true triglycerides to ensure optimal absorption and results. 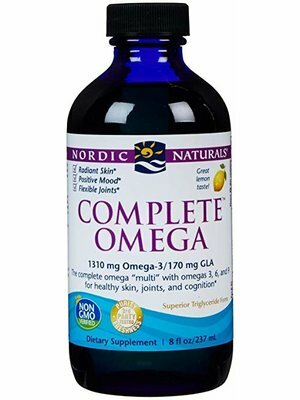 THE ALPHA OF OMEGAS- At Nordic Naturals we believe that omega oils are essential to life. By correcting the global omega-3 deficiency, we give each generation what they need to grow healthy and strong. Through science and innovation, we are committed to delivering safe, effective omega oils. See our other lines of soft gels, chewable vitamins kids gummies and more.